I was back on familiar ground last weekend when I went to see Manchester City play Crystal Palace. And what I saw, I found surprising and worrying for City's sake, and that's why Liverpool look far more likely to win the Premier League this season than City. A team which wins the league usually loses two or three games in a season - City have lost three in 18 days. It's too early, way too early, to say that Pep Guardiola's time is up, but I do wonder about the timing of these things. I always remember what Pep said about Barcelona, that he was so intense that he had to leave after three years, that the job, the training, everything about the job was so all-consuming that three years was enough. And he said the same about Bayern Munich, yet he signed a new contract with City not so long ago. 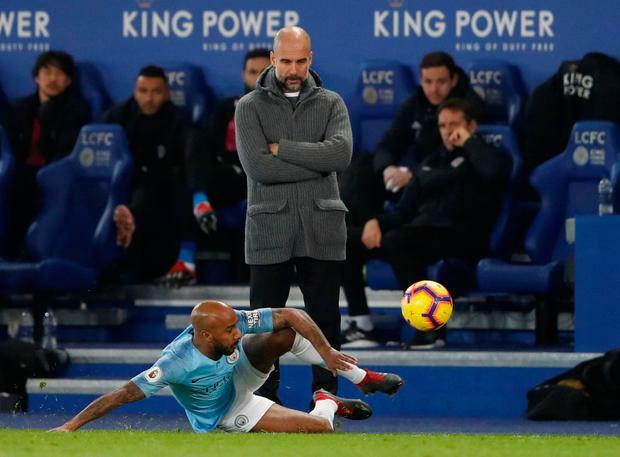 For me, there are signs of fatigue in that City team and they're not as sharp as they were at the start of the season. And I can't be sure if it is just a blip, or a real downturn in their fortunes, but what will make a difference to the outcome is what they do in the transfer window next month. It might sound strange to say that City, who have spent so much money building this team, need to go out again and buy in January but they need something different, maybe Pep will decide he has the faith in these players to turn it around but I see a squad that needs freshening up. Because they have been so good over the past two years you give City the benefit of the doubt and say it's just a blip they are going through, they have had injuries and Fernandinho's not been there and they were unable to replace him. When I saw City last weekend, they just lacked the zip and the speed that they seemed to play with all the time. At that match, when they lost to Crystal Palace, they just kept playing the ball from side to side, they'd get it wide and whip it into the box. Why, when you have Gabriel Jesus in the first half and Sergio Aguero in the second half, would you keep doing that, as Sakho and Tompkins just headed everything away, and City lacked the creativity to change it. City don't look like the same team at the moment, that could just be short term and they can climb out of it, or it could be more serious, but they need fresh faces. They had a lot of players away at the World Cup and that takes its toll after a while. City have missed Mendy for the best part of two seasons, Kyle Walker is on a bad run of form, it's been said for a while that Fernandinho (below) has not been replaced, they tried it with Fernando, they tried it with John Stones but this is a different position from what he is used to playing, and you can't make someone into the player that Fernandinho was, a specialised defensive midfielder, so City will have to buy a player in that position. As City go through their blip, it's all looking good at Anfield. What's impressed me most is their clean sheet record, that's 12 now for the season, way ahead of everyone else. I always knew Liverpool would score goals, once they got it right at the back they would be able to challenge. And Virgil van Dijk has been a massive part of that, he has been a calming influence on everyone else in the team, Liverpool have to defend more than City do in most games, so they need strong defenders, and they have them. When City are under pressure they don't have those strong defenders, they have more of the ball-playing type, so Liverpool have managed to get it right on that front. In Van Dijk they have a strong, dominant centre back who not only does his job, in defending well, but he never gets injured or suspended, he's available every week so the manager knows he can rely on him, and that's been huge for the team. Van Dijk calms the other defenders, he helps out the midfielders if they get a bit panicky, he has been brilliant. But it's a case of success all over for Liverpool: Fabinho has started to come good, Salah is scoring goals. At the moment they look unstoppable. And unlike City, Liverpool don't need to buy in January as it's all in place for them, the have the right cover in all positions. The Manchester United teams that won leagues had built a strong base so they knew they'd always be in the game, Liverpool did it the other way, they had great attackers and midfielders but struggled in defence, the goalkeeper wasn't always convincing. Now, they have it all in place, in the time that Klopp has been there he has spent very big money on two particular players, Alisson and van Dijk, but it's worked. Manchester United bought players and tried to fit them into their system but it didn't work, Liverpool built their system until all they needed was a great defender and a world class keeper, and they have that now. So you'd have to list Liverpool as title favourites now. They have a big game this weekend, Arsenal at home, but from the position they are in now they have to aim to win all of their home games, Anfield has been a fortress this season and that can be a basis. Arsenal have hit a bit of a blip as well and it's a good time for Liverpool to play them, Aubameyang's hit form lately but if you look at tomorrow's game, you can't see Arsenal winning. And I still have my doubts about Tottenham, they lose too many games and they will probably lose another three or four between now and the end of the season, there are days when Spurs let themselves down, maybe there is too much going on at the club with the new stadium. Spurs will stay up there and be a threat. But they will not win the Premier League. Liverpool took off in the second half of last season and got stronger as they went on, if they do the same this season the Premier League could be over in a couple of months.